Emphasizing Substrate Care for Better Quality Control - Pompei, Inc.
Floors are only as good as the surface they are placed on, which is why we study every surface before installation. To do so, we take internal moisture readings of every concrete slabs using relative humidity with In-Situ Probe tests. We also provide concrete scanning and laser topographical mapping that allows us to better understand the potential issues that can occur. This allows us to determine proper substrate grinding and fill required to meet finish floor flatness and address critical elevations throughout the building. Additionally, every stairway structure is reviewed thoroughly to determine proper rise and run of stair treads and risers, which reinsures proper installation. All surfaces have to be flat in order to apply finishes. If the flatness is not achieved before installation, self-leveling or mortar can be applied. These materials allow small repairs to areas in order to achieve flatness. Mortars can be cement or epoxy. Unlike self-leveling or epoxy mortars, dry pack mortars do not flow and therefore can be installed to any elevation required in a short distance. Dry pack mortars are a great way to bring floors to specific elevation points without having to level the entire floor. Polished concrete is concrete that has been processed through a series of mechanically ground polishing or grinding steps. The steps are similar to terrazzo installation. Reflectivity of the floor can be control through diamond grinding, polishing and sealing systems to achieve a sleek, polished look. Concrete polishing can also include staining and overlay systems. The design options are endless with concrete polishing, and any color can be applied. Refinishing terrazzo can be a long and difficult process, but the right materials and equipment allow for a systematic approach. To bring the floor back to its original shine, diamond griding, grouting, polishing and sealing occur. A natural high finish can be achieved using a gradual diamond grit system, as high as 3,000 grit. This provides for a mirror, stone like finish with less maintenance. No sealer is required while using this system. We truly believe that the Richmond and Hampton Roads markets will greatly benefit from these services. By providing proper substrate preparation and care, we are ensuring that all projects are the best they can be. All flooring systems are taken into consideration, so we can provide the best quality for every project. With over 65 years working in the Commonwealth of Virginia, Pompei continues the tradition of excellence that is was founded on. 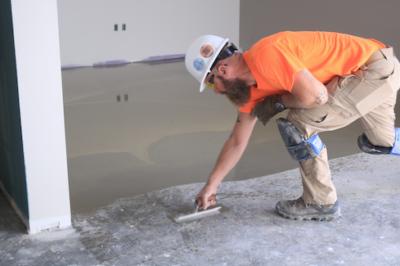 A local subcontractor in the Hampton Roads and Richmond areas, the company holds high standards when it comes to the installation of tile, terrazzo and stone, and to the preparation of flooring surfaces. If you have a project that needs Pompei’s special touch, please contact us today.